With NEXCOM’s latest series of Mobile Surveillance Systems, smart buses can drive toward an intelligent future with enhanced transport safety, service efficiency, and passenger satisfaction. Mobile surveillance system simplifies delivery of smart bus service. NEXCOM’s newly released Mobile Surveillance Systems provide mobile surveillance, fleet telematics, in-vehicle infotainment, and passenger Wi-Fi simultaneously, simplifying delivery of smart bus service. 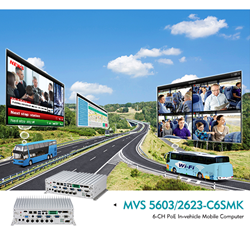 Featuring system performance, flexible customization, industrial-grade reliability, and rich software utilities, MVS 5603-C6SMK and MVS 2623-C6SMK are designed from the ground up to offer versatility and functionality required of smart bus applications. With NEXCOM’s Mobile Surveillance Systems onboard, smart buses can drive toward an intelligent future with enhanced transport safety, service efficiency, and passenger satisfaction. To alleviate safety concerns over bus transport, the Mobile Surveillance Systems provide comprehensive surveillance coverage with six PoE ports with M12 connectors. While video streaming and recording is secured with screw-locking M12 connectors, footage can be stamped with GPS coordinates, time, speed, and other vehicle data to give more context, as well as to facilitate video search. In addition to steering clear of door clamping accidents and rear-end collisions with blind spot monitoring, the MVS systems can also produce video evidence to accelerate accident liability evaluation and dispute settlement. Considering the need of video retrieval, optional 3G/LTE/Wi-Fi connectivity is supported for remote access, and local storage units can be accessed externally. Available with an Intel® Core™ or Intel Atom® processor, the Mobile Surveillance Systems have plenty of computing headroom to support fleet management. Equipped with a rich I/O set that can include CAN bus, programmable GPIO, COM, USB, and a total of five expansion slots for mini-PCIe and M.2 modules, these MVS systems can flexibly be configured for onboard diagnosis over SAE J1939/1708 protocols, high-speed internet connections at up to 600 Mbps, and driver management and theft prevention, leveraging iButton-based driver authentication and 24/7 tracking. For above scenarios to unfold, software utilities are built in to reduce engineering efforts and cut time to market of end applications. Bus carriers can also take advantage of NEXCOM’s Mobile Surveillance Systems to improve passenger services. Route information display, audio stop announcement, news broadcasting, and advertising, among many other things, can be brought onboard by the MVS systems. Further, passenger Wi-Fi can be deployed with the integration of up to five Wi-Fi/3G/LTE modules, which eliminate the need to install discrete Wi-Fi router units and lower the total cost of ownership for service delivery.